7305. Laura Webb Thomas, “Children of Lester Guy Webb and Emma Jane Hodge,” July 23, 2018. I was reviewing your tree and wanted to let you know that there is one additional child, Thomas C. Webb, who is still living. My father, designated as living, was James William Webb, b. 7/22/28 d. 10/11/2016. 7306. “Obituaries,” Elmer C Hartshorn, Lincoln Journal Star, Lincoln, NE, February 25, 1967, 11. HARTSHORN - Elmer C, 71, Grandview, Wash., retired mason, died Friday. Born Massena, Iowa. Lincoln resident 44 years. Member: First Methodist. Survivors: wife, Mae, Grandview; son, Milo, Grandview; daughters, Mrs. Bonnie Griffin, Grandview, Mrs. Delores Tuttle, Yakima, Wash., Mrs. Martha Grell, Lincoln, Mrs. Patricia Studnicka, Lincoln; sisters, Mrs. Cora Jenkins, Council Bluffs, Iowa, Mrs. Florence Harler, Omaha, Mrs. Ruby Watson, Bremerton, Wash., Mrs. Maude Harris, Villisca, Iowa; 15 grandchildren; three greatgrandchildren. Services: 10 a.m. Tuesday, Smith's, Grandview. Burial: Grandview. 7315. “Obituaries,” Larry L Houser. Larry L. Houser, age 79, of Grandview, WA went to be in the arms of his Heavenly Father on December 29, 2017 surrounded by his loving family. Larry was born on May 2, 1938 in Lincoln, Nebraska the son of Bertha Marie (Hess) and Roy Manuel Houser. Larry received his education in Grandview and graduated with the Grandview High School Class of 1956. In 1959 he married Bonnie Mears in Grandview, WA. Larry served in the Army Reserves for eight years. For 38 years Larry worked for Bleyhls in Grandview, WA until his retirement. He enjoyed repairing things for other people along with his wood working projects. Larry was a member of the Immanuel Lutheran Church in Grandview. He is survived by his loving wife, Bonnie J. Houser of Grandview, WA. One daughter Lori Taylor (David) of Deer Park, WA. One granddaughter Lindsay Henley (Tad) of New Port, WA and one grandson, Scott Taylor (Dannielle) of Deer Park, WA. Larry is also survived by three great grandchildren Aria, Kylan and Theo, one brother Ed Houser of Mabton, WA and one sister Judy Poteet of Auburn, WA. Larry is prededed in death by his parents, Bertha and Roy Houser. A Celebration of Life Service will be held on Saturday, January 6, 2017 at 11:00 A.M. at the Immanuel Lutheran Church in Grandview, WA. In lieu of flowers those wishing to honor Larry’s memory may contribute to the Sunnyside Heartlinks Hospice or Immanuel Lutheran Church. If you would like to sign Larry’s online memorial book you may do so at www.funeralhomesmith.com Smith Funeral Home in care of arranements. 7321. 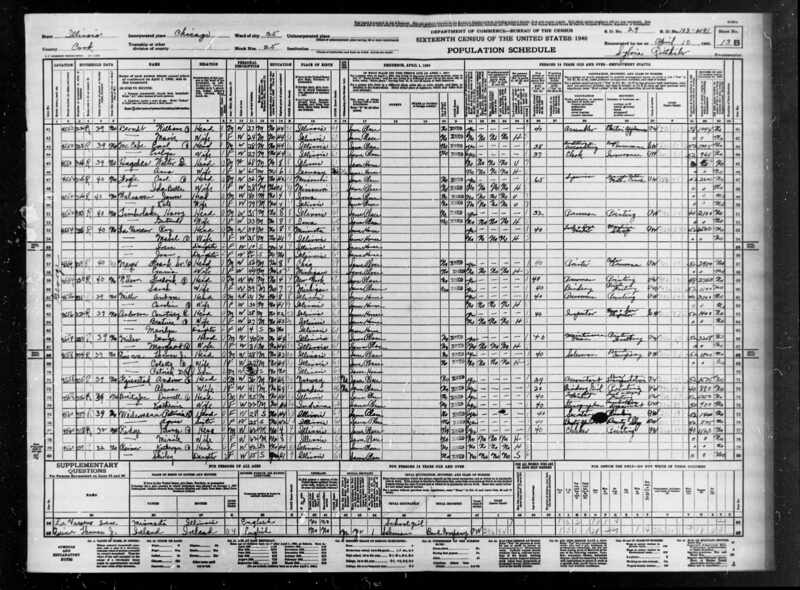 Illinois, Cook County, Birth Certificates, 1871-1940, “Marilyn Anderson,” March 25, 1935, Chicago, Cook County, IL, 11441, https://www.familysearch.org/ark:/61903/1:1:QL9S-9Z4Y. 7322. “United States Census,” 1940, IL, Cook, Chicago, Ward 35, 13B, 103-2191, 29, T627, 5459748, 93, Bureau of the Census, US Dept. of Commerce, United States of America, April 10, 1940, Sylvia Ritthaler. 7323. “Robert D Johnson,” Find-A-Grave, https://www.findagrave.com/memorial/186395308, 186395308. 7324. “M Johnson,” Find-A-Grave, https://www.findagrave.com/memorial/186395316, 186395316. 7325. Johnson, Arthur, World War I, 1917, NE, 579, “United States World War I Draft Registration Cards, 1917-1918,” June 5, 1917, Plum Creek, Pawnee County, NE, https://www.familysearch.org/ark:/61903/1:1:KZVQ-PXT. 7326. “Death Notices,” Diane Lynn Say, Yakima Herald-Republic, Yakima, WA, April 19, 2011. Diane Lynn Say, 59, of Grandview died Friday. Mrs. Say was born in Lincoln, Neb. Survivors include her parents, Joe and Dot Marple; a daughter, Elizabeth Alba; companion, Dave Sandberg; and two grandchildren. 7346. 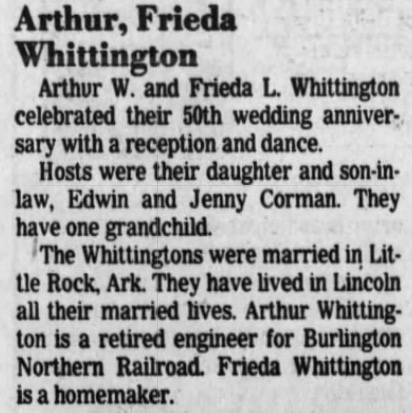 “Anniversaries,” Arthur and Frieda Whittington, Lincoln Journal Star, Lincoln, NE, April 14, 1991, 80. Arthur W. and Frieda L. Whittington celebrated their 50th wedding anniversary with a reception and dance. Hosts were their daughter and son-in-law, Edwin and Jenny Corman. They have one grandchild. 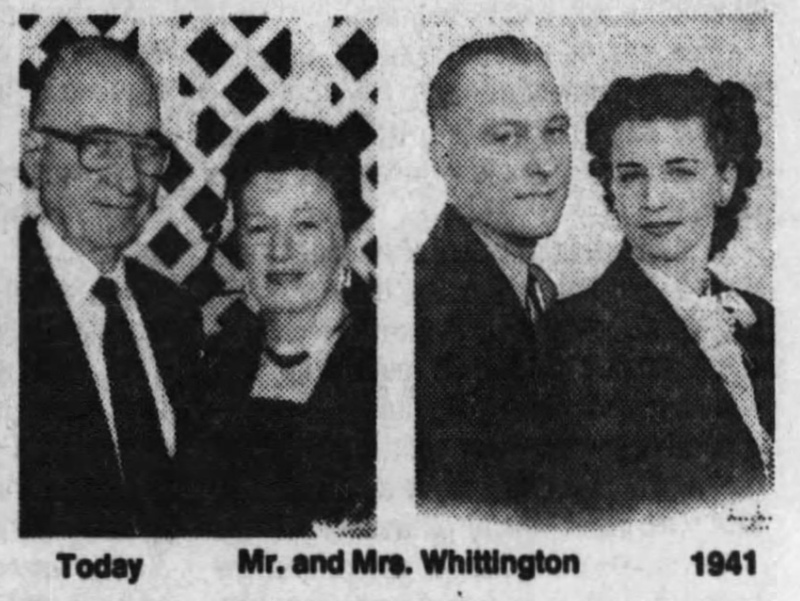 The Whittingtons were married in Little Rock, Ark. They have lived in Lincoln all their married lives. Arthur Whittington is a retired engineer for Burlington Northern Railroad. Frieda Whittington is a homemaker. 7348. “Obuaries,” Ervin L Kraft, Lincoln Journal Star, Lincoln, NE, December 11, 2003, 13. Ervin L. Kraft, 70, Henderson, Nev., formerly Lincoln, died Tuesday (12/09/03). Born, Lincoln. Owner, parking garage. Survivors: wife, Jane (Will) Kraft; sons, Jon, Washington, D.C., Joe, San Diego; two grandchildren; sisters, Frieda Whittington, Johanna Alles, both Lincoln; brother, Earl, Lincoln. Graveside services: Friday, Paradise Memorial Gardens, Henderson. 7350. “Obituaries,” Charles B Houser, Lincoln Journal Star, August 29, 1993, 22. Houser—Charles B., 79, 6312 Seward St., died Monday (8/23/93). Survivors: daughters, Delores Freeman, Barbara Waddle, both Lincoln; brother, Roy, Grandview, Wash.; sisters, Delma Tanner, Lincoln, Lila Sutter, Denver, Edith Alton, Greeley, Colo., Maud Marple, Mae Hartshorn, both Grandview, Wash.; three grandchildren. Services: 11 a.m. Monday, Lincoln Memorial Funeral Home, 6800 S. 14th St. Visitation: one hour before services, mortuary.